The Hollywood Chamber of Commerce honored actor and humanitarian Gary Sinise with the 2,606th star on the Hollywood Walk of Fame today, Monday, April 17, 2017. The star in the category of Television was dedicated at 6664 Hollywood Boulevard in front of The Supply Sergeant - a fitting location for a man who has worked with the military for so many years. 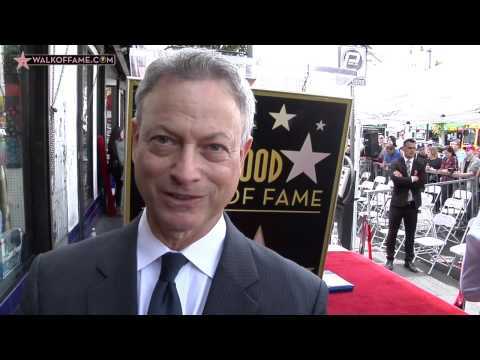 “Gary Sinise makes sure the world remembers the active duty men and women and their service to the country! His memorable roles and continued advocacy mission make his star shine so bright!” said Ana Martinez, Producer of the Hollywood Walk of Fame. Helping Emcee and Hollywood Chamber President/CEO Leron Gubler to unveil the star were actors Patricia Heaton, Joe Mantegna and Air Force General Robin Rand. The star ceremony started with a special tribute to Gary Sinise with LAFD apparatus, a color guard from L.A. City and L.A. County honor guards followed by the star spangled banner sung by “America’s Tenor” Steve Amerson. Gary Sinise was born in Blue Island, Illinois, to a family who supported his artistic endeavors, and encouraged his ambition to create. After graduating from high school in Highland Park, at the age of 18, he co-founded Steppenwolf Theatre Company of Chicago along with friends Terry Kinney and Jeff Perry, where he served as Artistic Director for seven years. Having showcased the talents of many notable actors, and already in its fourth decade as a professional theatre company, Steppenwolf has received unprecedented national and international recognition from the media, theatre critics, and audiences alike. He has starred in more than a dozen productions at the renowned theatre including the role of Tom Joad in The Grapes Of Wrath, for which he garnered a Tony Award nomination and a Drama Desk Award; Balm In Gilead, Of Mice And Men, Streamers and The Caretaker. He received a Joseph Jefferson Award for Marsha Norman’s Getting Out at Chicago's Wisdom Theatre. He starred as Stanley Kowalski in A Streetcar Named Desire, and Randle Patrick McMurphy in One Flew Over The Cuckoo’s Nest at Steppenwolf, the Barbican Theatre in London, and then on Broadway, earning him another Tony nomination for Best Actor. In 1982, Sinise directed and co-starred with John Malkovich in the landmark production of Sam Shepard’s “True West” at Steppenwolf and off Broadway, where he won an Obie Award for Best Director. In 1995, he directed Sam Shepard’s Buried Child which kicked off Steppenwolf's 20th Anniversary season and continued with a successful run on Broadway where it was nominated for five Tony Awards, including one for Sinise for Best Director. His other directing credits include Tracers, Frank's Wild Years with Tom Waits, The Miss Firecraker Contest, Waiting For Parade, Action, Road To Nirvana, ‎Landscape Of The Body, and Lyle Kessler’s Orphans, which also played off-Broadway and in London with Albert Finney. Sinise also made his mark as a feature film director with “Of Mice And Men,” which he co-produced and co-starred in with John Malkovich, as well as “Miles From Home” starring Richard Gere, Kevin Anderson, Helen Hunt and John Malkovich. Both premiered at the Cannes Film Festival. He’s delivered award-winning performances on television including HBO’s “Truman” (Golden Globe, CableACE and Screen Actors Guild) and John Frankenheimer’s “George Wallace” (Emmy, Screen Actors Guild, and CableACE) for TNT. Sinise also starred in Stephen King’s “The Stand,” CBS/Hallmark’s “Fallen Angel,” Showtime’s adaptation of Jason Miller’s Pulitzer Prize winning play “That Championship Season” directed by Paul Sorvino, and played supporting roles in HBO’s “Path To War” directed by John Frankenheimer, and Hallmark Hall of Fame’s “My Name Is Bill W.” with James Woods and James Garner. Sinise currently stars on the series “Criminal Minds: Beyond Borders,” in its second season on CBS. He previously starred as Detective “Mac” Taylor in CBS’s highly successful “CSI: NY.” The series ran for nine seasons and was executive produced by Jerry Bruckheimer and Anthony Zuiker. He was the subject of the Fox News documentary, On The Road In Iraq With Our Troops And Gary Sinise, which highlighted his fourth USO tour to the country. Sinise is also the subject of the feature length documentaries Lt. Dan Band: For The Common Good, a film about his travels in support of the U.S. military and first responders of 9/11 in New York City, and High Flight: A Voyage To The Edge Of Infinity about his flight to 70,000-ft on a U2 Dragon Lady spy plane. Sinise executive produced the film “Brothers At War,” a rare look at the bonds and service of our soldiers on the frontlines, and the profound effects their service has on the loved ones they leave behind. He founded Operation International Children with Seabiscuit and Unbroken author Laura Hillenbrand. The program operated from 2004 to 2013 to give concerned citizens of the world a way to reach out to children in war-stricken countries and support American troops in their efforts to assist them. Sinise served as the national spokesperson for the American Veterans Disabled for Life Memorial Foundation, which raised a memorial in Washington, D.C. in October 2014 to honor America’s three-million disabled veterans. He was involved in raising funds for The Pentagon 9/11 Memorial, as well as raising funds to build The Brooklyn Wall of Remembrance at MCU Park in Brooklyn, NY. In 2011, he launched the Gary Sinise Foundationto honor the Nation’s defenders, veterans, first responders, their families, and those in need. The Foundation provides and supports unique programs designed to entertain, educate, inspire, strengthen and build communities. Through its R.I.S.E. program (Restoring Independence Supporting Empowerment), specially adapted smart homes are being constructed for severely wounded veterans nationwide. Each one-of-a-kind home is customized to ease the everyday burdens of a wounded hero, their family, and caregivers. Other programs include Relief & Resiliency Outreach, Invincible Spirit Festivals, Gary Sinise & the Lt. Dan Band, Arts & Entertainment Outreach, Serving Heroes and First Responders Outreach. Its latest program, Soaring Valor, is sending WWII veterans to The National WWII Museum and documenting their first-hand accounts of the war. For more information, please visit GarySiniseFoundation.org. His endless work on behalf of those who’ve served has earned Sinise many distinguished awards including The Bob Hope Award for Excellence in Entertainment from the Medal of Honor Society, the Spirit of the USO Award, The Ellis Island Medal of Honor, the Spirit of Hope Award by the Department of Defense, and the Dwight D. Eisenhower Award from the National Defense Industrial Association. In 2008, George W. Bush presented him with the Presidential Citizens Medal, the second-highest civilian honor awarded to citizens for exemplary deeds performed in service of the nation, only the third actor ever to receive this honor. In 2015, he received the Sylvanus Thayer award from the West Point Association of Graduates as well as The Bradley Prize in 2016. In 2017, he was honored by USO-Metro with the Legacy of Hope award, which is named after Bob Hope and was presented to Sinise for his tireless efforts to meet and entertain troops around the world. Sinise is an Honorary Chief Petty Officer by the United States Navy and an Honorary Marine by the United States Marine Corp. A full list of honors can be found on the foundations website at Gary Sinise - Honors. He received an honorary Doctorate in Humane Letters for his work in theatre and film as a Producer, Director and Actor from Amherst College, and an Honorary Degree of the Doctor of Fine Arts from CSU Stanislaus. Sinise hosts via video the Mission: Space, a centrifugal thrill ride at the Future World section of Epcot in Walt Disney World in Florida.